Orlando’s Best Kept Secret: Locally owned & operated. Conveniently located close to I-4 in the heart of international drive. Less than 3 miles from the Orange County Convention Center. WhirlyDome brings the sport of WhirlyBall to Orlando! 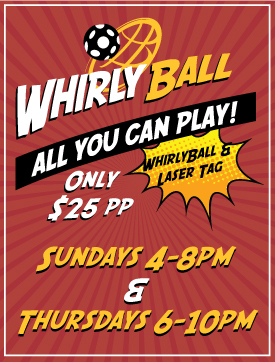 The WhirlyDome, conveniently located close to I-4 in the heart of International Drive, introduces Orlando to the world’s first totally mechanized team sport – WhirlyBall. This sport is best described as a combination of bumper cars, basketball, Jai-alai and hockey. The game is typically played 5-on-5, with players piloting WhirlyBugs (high tech bumper cars) as they use a scoop to pass and shoot a plastic ball at their opponent’s goal while bumping and blocking their way around the court. Games have a referee to enforce the rules, keep score and make sure all players have a great time. The game requires no prior experience – and absolutely no athletic skills at all! Already popular in Chicago, Detroit and Atlanta and other cities, WhirlyBall Orlando is sure to be a winner with two courts available for play. WhirlyDome also offers Lazer Frenzy, where players navigate a maze of laser beams, haze and mirrors, as well as the latest in Laser Tag. Guests will also find pool tables and a variety of arcade games. WhirlyDome isn’t just a place to play, it’s also a place to relax and unwind while enjoying a drink or dinner in the delicious restaurant adjacent to the Whirlyball court. Bloodhound Brew is a casual pub featuring local specialty craft beers and a full menu made from scratch with both indoor and outdoor seating. Just looking to come in with a few family/friends? There is no admission charge at the WhirlyDome. Visitors pay only for activities that they take part in. Parking is free and we have a huge lot directly in front of the building.